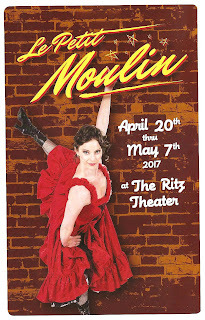 In my biannual excuse to watch dance (which I love, but just don't have time for with all the theater I see), I attended opening night of COLLIDE Theatrical Dance Company's latest "original jazz dance musical" La Petit Moulin last weekend. COLLIDE's shows are always great fun - gorgeous dancing, incredible live music, short and sweet so you're outa there in under two hours. For someone who sees a ton of theater, it's a nice palate cleanser to watch a story unfold with nary a word said. 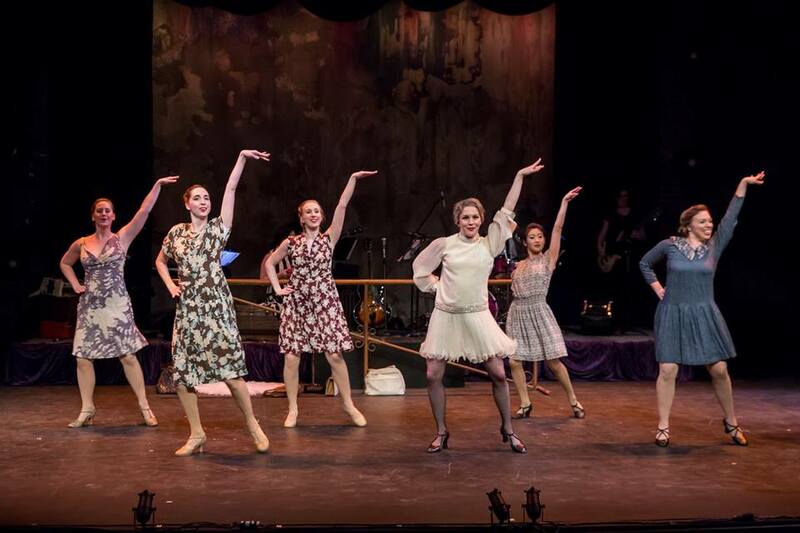 Now in their 5th season, the COLLIDE team (choreographer Regina Peluso, Director Josh Campbell, and Music Director Doug Rohde), the musicians, and the dance company are experts at telling a story solely through music and dance. The plot synopsis is printed in the program for those of you who, like me, are more literal minded and like to know precisely what's going on. Or you could choose to not read it and just let the story wash over you in a flurry of belted out songs and twirling skirts. The characterization and plot is clear enough in the dance that you'll get the idea of the story either way. In this case the story involves soldiers returning to Paris after WWI, and the women they left behind who now have to pick up the pieces and carry on if their men don't return. Nightclub owner Sebastian (Michael Hanna) was injured in the war and can no longer dance, which understandably puts him in a foul mood. He reopens the club with the help of his friend Marco (Cameron Meilicke) and hires some new dancers after a charming A Chorus Line-like audition scene. New dancers include newly widowed Donna (Heather Cadigan Brockman) and her somewhat less graceful sister Juliette (Andrea Mislan), who first works as a waitress until thrown into the dance line. It's rough going at first with some clashing of ideas and personalities, but it's a dance musical, so everyone makes up (and a couple falls in love) in time for the final dance number. The music is an eclectic mix of classics and pop music performed by the four-piece onstage band, who sound great (but with a bit too much amplification for my taste). Vocals are by the always fabulous Katie Gearty (in an array of ever more stunning dresses) and Michael Hanna in character as Sebastian, nearly bringing the house down accompanying himself on the piano singing a heart-wrenching "Nobody Knows You When You're Down and Out" (somebody please cast him in a full-fledged musical!). I don't know enough about dance to speak intelligently about it, except to say the dancing is fun to watch, character-defining, and conveys the emotions of the story. Heather Cadigan Brockman as Donna is particularly cool, confident, and elegant in a way that makes me want to be her. 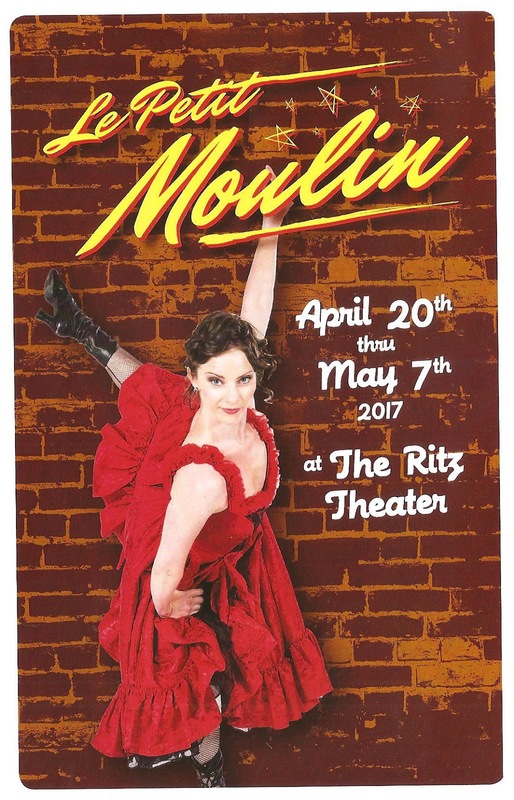 The Ritz is such a great theater for dance, and set designer Sarah Brandner does a great job matching the walls of the set with the bare brick walls of the theater, and her lighting design creates the appropriate drama. 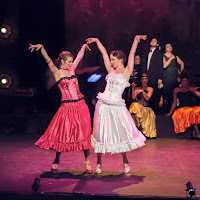 The dancers are equally comfortable dancing in period street clothes as they are in the flamboyant can-can costumes.